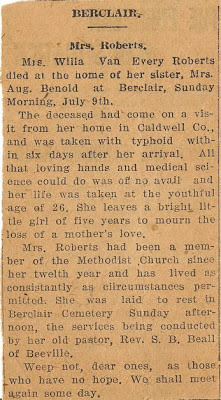 Back in October I shared an obituary I found in the Lockhart Post Register for my maternal grandmother's sister, Willa (Van Every) Roberts. It had been written by another sister of my maternal grandmother, Minnie (Van Every) Benold, and had appeared on July 20, 1916, 11 days after the death. 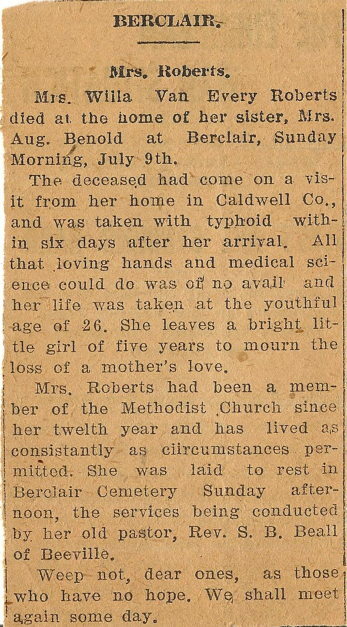 Since then I discovered another obituary mixed in with some other newspaper clippings my grandmother preserved. I don't know what newspaper it appeared in, but I believe it was written by someone else, as there are differences in style. It also fills in a few additional details. The obituary I shared back in October is shown below on the right, though I do not re-transcribe it. 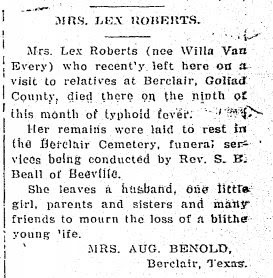 Mrs. Willa Van Every Roberts died at the home of her sister, Mrs. Aug. Benold at Berclair, Sunday Morning, July 9th. The deceased had come on a visit from her home in Caldwell Col., and was taken with typhoid in six days after her arrival. All that loving hands and medical science could do was of no avail and her life was taken at the youthful age of 26. She leaves a bright little girl of five years to mourn the loss of a mother's love. Mrs. Roberts had been a member of the Methodist Church since her twelfth year and has lived as consistantly (sic) as circumstances permitted. She was laid to rest in Berclair cemetery Sunday afternoon, the services being conducted by her old pastor, Rev. S.B. Beall of Beeville. Weep not, dear ones, as those who have no hope. We shall meet again some day. 1) We learn the pastor who conducted the service was Willa's 'old pastor' - possibly her childhood pastor. It is also confirmed that she died in the home of the Benolds. 2) This obituary doesn't mention that she left behind a husband. From this letter Willa wrote, it's clear she didn't consider the marriage a happy one, and she was only staying in it out of a sense of duty. The child was raised by Willa's parents, and later by another sister of Willa's. The 'original intent' of the 'visit' to her family is unclear. 3) This obituary clearly appeared first, probably within a couple days of the burial. There appears there may have been a delay of almost a week before Minnie wrote the letter to the Lockhart Post.